“Master, a friend told me today that I should never use the editor’s copy-paste functions when programming,” said the young apprentice. “I thought the whole point of programming tools was to make our lives easier,” he continued. The Master stroked his long grey beard and pressed the busy button on his phone. This was going to be one of those long, important discussions. “Why do you think copy-pasting is wrong?” asked the Master. “Exactly true, my young friend,” nodded the Master. “But it’s so much easier to copy-paste code than to grapple with the alternatives,” continued the apprentice. “Of course I know them,” replied the disciple cockily. The Master was busily jotting down the apprentice’s answers and his own ideas in a table (see table 1). His continued firing off questions. “But does this approach scale when you have many dimensions of variation among even more dimensions of similarity?” probed the Master. The Master nodded appreciatively. “Is there a better way to express variations of code?” he asked, encouraging his friend to show off his knowledge. The apprentice raised an eyebrow at the leading question and playfully continued the Master’s game. “I’m very glad you asked me this. Indeed, we can abstract commonality and variability by organizing our code and data in a class hierarchy. Common elements go to the base classes, and classes derived from them contain the elements that vary.” He paused. “Yet I sometimes indulge in copy-pasting because I feel that abstracting might not be worthwhile. Master, do you think there are limits to what we should abstract?” he asked hesitantly. Figure 1. 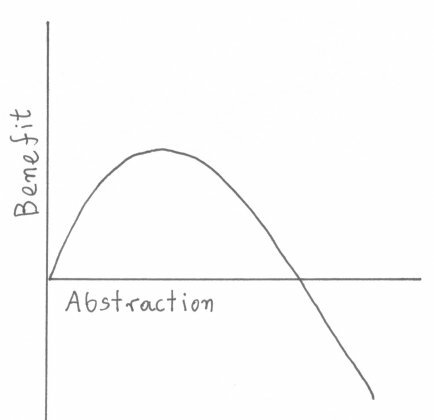 Abstraction and its benefits. 1. A. Hunt and D. Thomas, “OO in One Sentence: Keep It DRY, Shy, and Tell the Other Guy,” IEEE Software, vol. 21, no. 3, 2004, pp. 101–103. 2. Z. Li et al., “CP-Miner: Finding Copy-Paste and Related Bugs in Large-Scale Software Code,” IEEE Trans. Software Eng, vol. 32, no. 3, 2006, pp. 176–192. 3. D. Spinellis, “Another Level of Indirection,” Beautiful Code, A. Oram and G. Wilson, eds., O’Reilly, 2007. Chapter 17, pp. 279–291.